For Vee's January Note Card Party, I've cooked some Pasta Fagioli Soup for you, to warm your heart and soul. For dessert, you have several choices....would you like a Melting Snowman Cupcake? Perhaps you'd like to sit by the fire and have a Soft Frosted Sugar Cookie? Maybe you'd like to try an old-fashioned Date Bar, while we visit and warm up? Come on over and stay awhile and I'll fix us a warm cup of hot chocolate, tea, or coffee. I'll have a date bar please:@) All fun seasonal pics Kitty! When I was a kid, we would go to a bakery and get date bars to take when we went camping in the summer. I have such good memories of that! A little cool to go camping now! lol Love your photos for cards this month! Sweet hugs! I'll be right over. You and Vee have my mouth watering!! Mmm, soup and a date square for me please! Your tablescapes make enticing note cards Kitty. Soup and a snowman cupcake, set on a snowman tablescape sound scrumptious! Lovely note cards, Kitty! A date bar and a nice cup of hot chocolate will be lovely please ... I'll be right there. Everything looks so yummy. I'm visiting from Vee's notecard party. Fun notecards on a food theme--and they are making me hungry! Perfect for January! soup and dessert --- perfect. i'll have a date bar, please. Hi Kitty! These are great cards!! I'm just crazy about that cute snowman in your second picture; isn't that the one you made last year? You're so talented! I have a snowball candle like yours on one of my cards this month, too. You and I must have been on the same wave length. :) As always, your recipes sound wonderful, Kitty, and I love your cozy vignettes. Great notecards! My hubby would love your date bar! I'd like some of everything! It all looks so warm and cozy there! YUM! I'll be right over! Kitty...what scrumptious note cards! 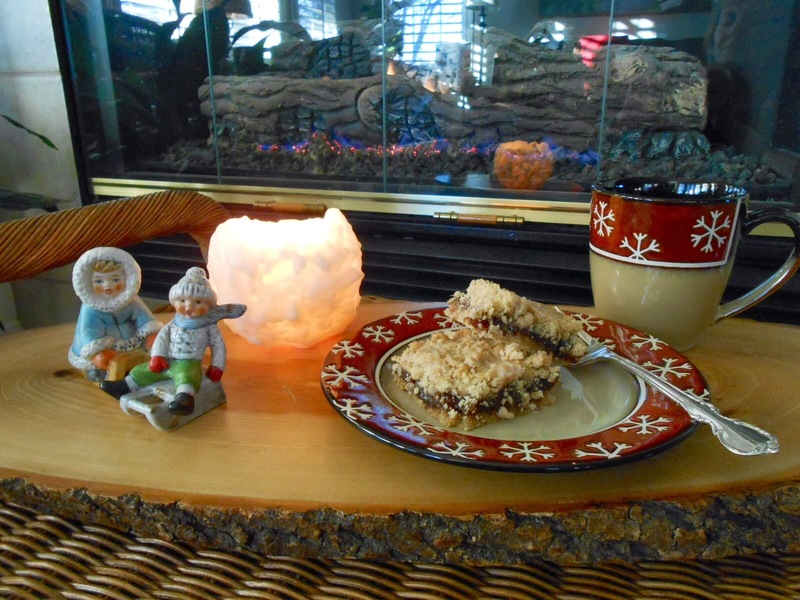 All of your vignettes are so warm and inviting....love all the cute seasonal dishes too! Soup and a date bar would be delectable! Lovely, cozy images to warm a winter's day. I'll be there in a jiffy! Yes please to everything - The Pasta Fagioli Soup recipe interests me - looks like a great Winter standby dish! Lovely to meet up at Vee's dear Kitty. Oh Kitty, you have made me very hungry! It's 10:00 pm here, do you think that's too late to find something to eat? :) Your food always looks delicious and makes me want to eat something when I see the photos. I'll take one of each. Strike that. I will take two of each. Then, I will feel so guilty about overeating that I will eat an extra date bar to stuff down the guilt. Just almost kidding. I did love everything you posted, and I think they would make wonderful cards, especially recipe cards. Love your cozy note card selections...perfect for a winter's day! That's the perfect comfort food for cold days. A yummy post, Kitty. I would love a bowl of soup and a date bar, please. Actually a cup of tea with you Kitty would be just grand! Thank you for sharing at my HOME. Enjoy the rest of your week, my friend. With the hot sunny days we are experiencing right now, we don't need comfort food and that is good. I still need to take of some of the "Christmas" that is lingering on my body. My mom used to make this from scratch for us and I loved it. Too bad I never got her recipe. She made it amazingly good. I would to be sitting at the cozy table having some. I just had a hot bowl of white chicken chili so date bar or cookie for me please! Always room for dessert. lol! All our heart warming cards. Thanks for sharing with SYC.